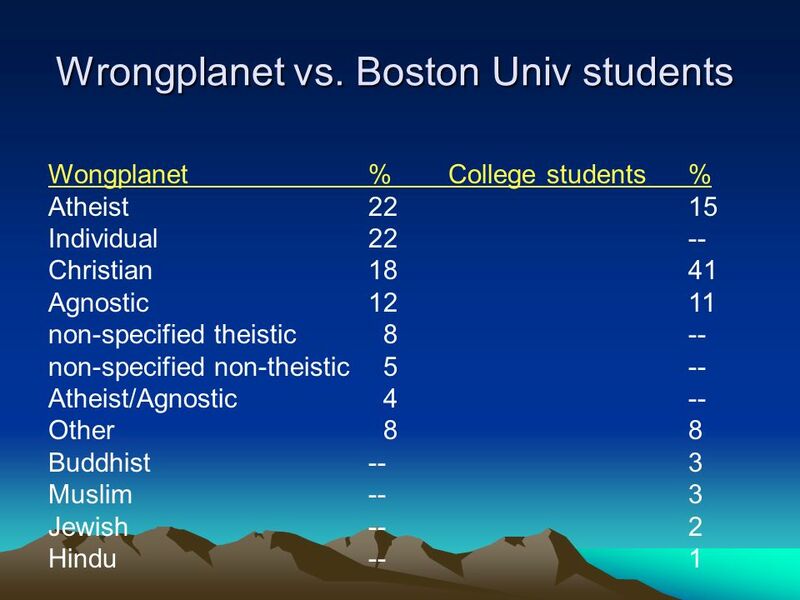 Born on the Wrong Planet? 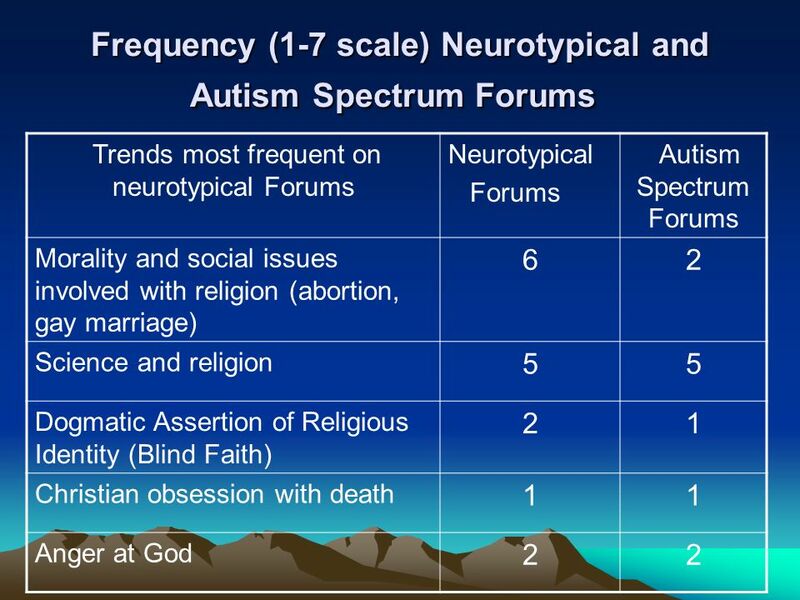 Using Forum Postings to Test Hypotheses about Special Interests and Religious Beliefs of Autistic Spectrum Young Adults Professor. 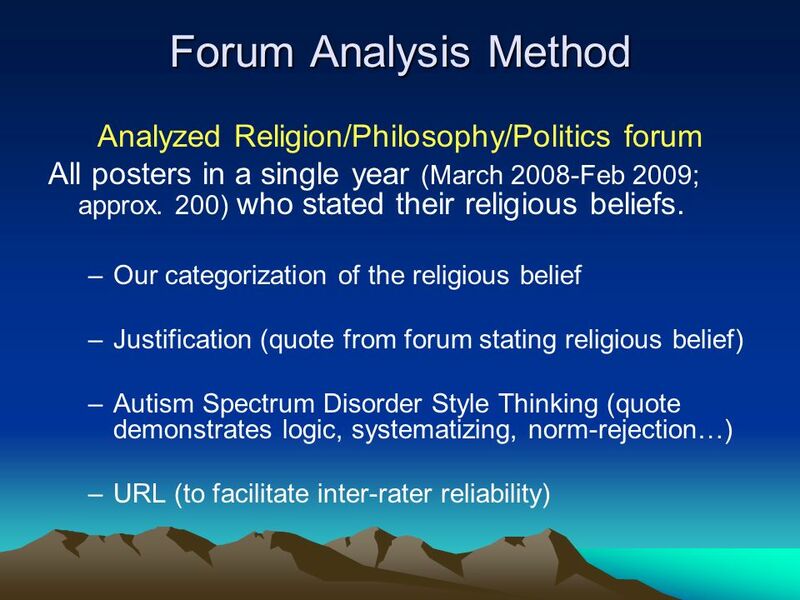 2 Why analyze forum postings? 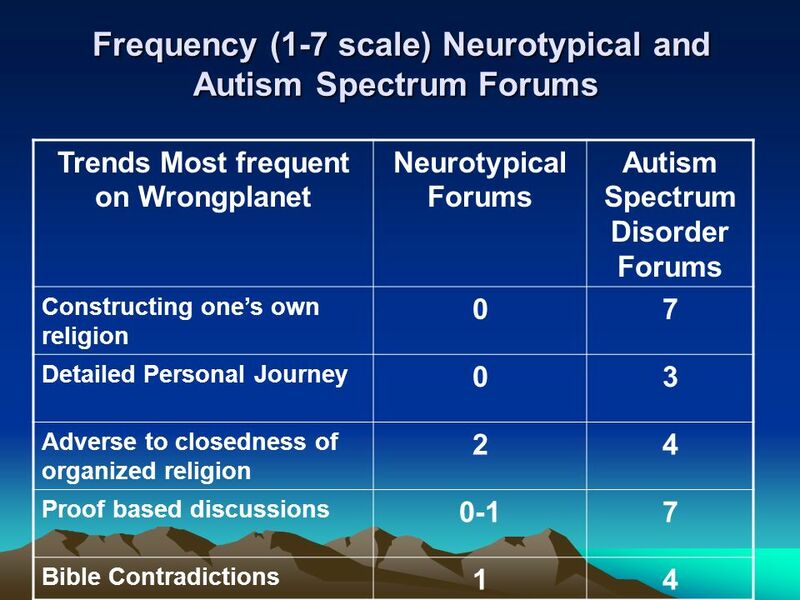 How do discussion forums function for your autistic spectrum friends, family members, patients, clients? 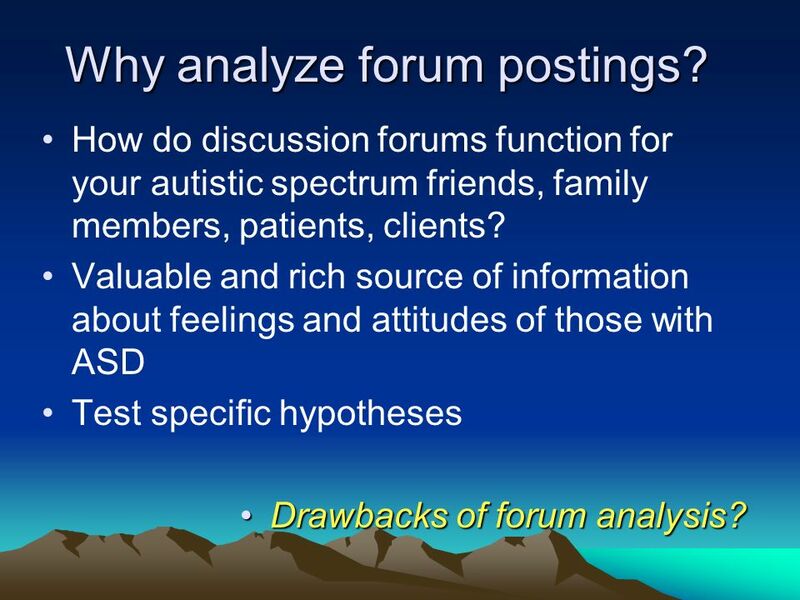 Valuable and rich source of information about feelings and attitudes of those with ASD Test specific hypotheses Drawbacks of forum analysis?Drawbacks of forum analysis? 6 Whos on the wrong planet? Age range: 13 - 50 years. 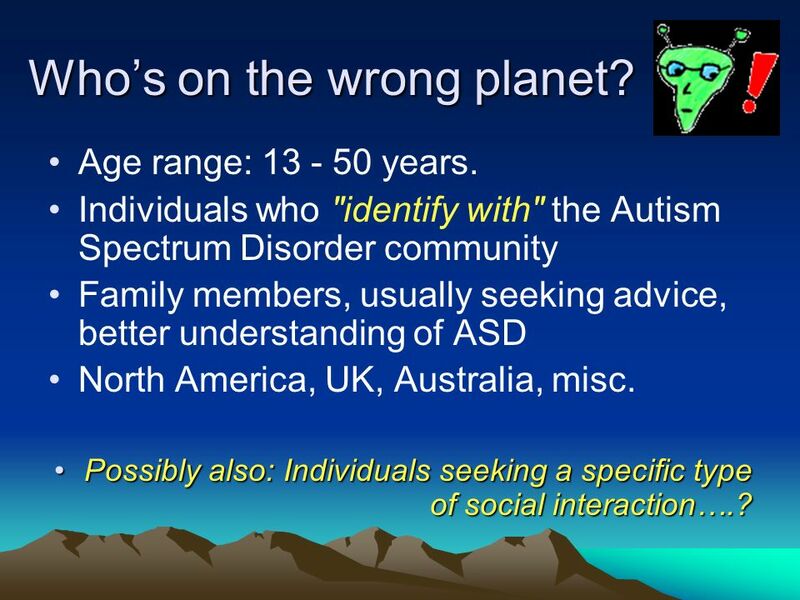 Individuals who "identify with" the Autism Spectrum Disorder community Family members, usually seeking advice, better understanding of ASD North America, UK, Australia, misc. Possibly also: Individuals seeking a specific type of social interaction…. 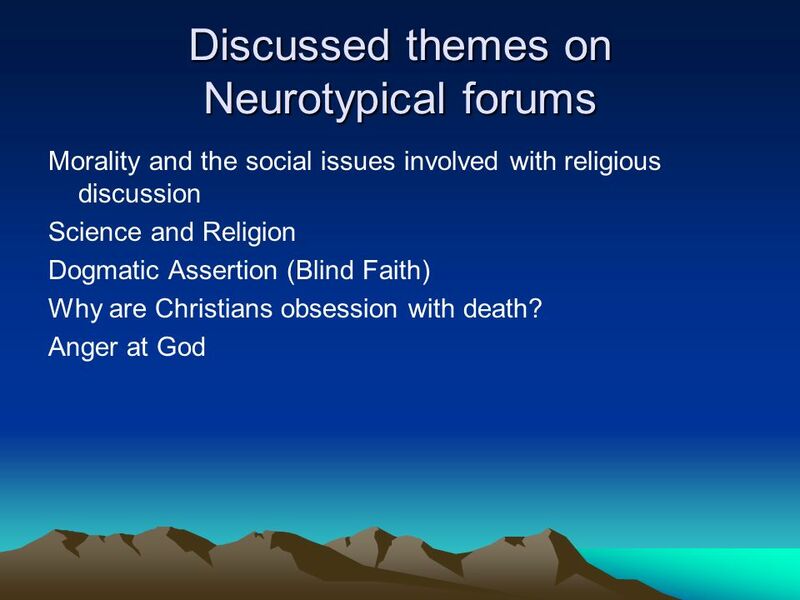 ?Possibly also: Individuals seeking a specific type of social interaction….? 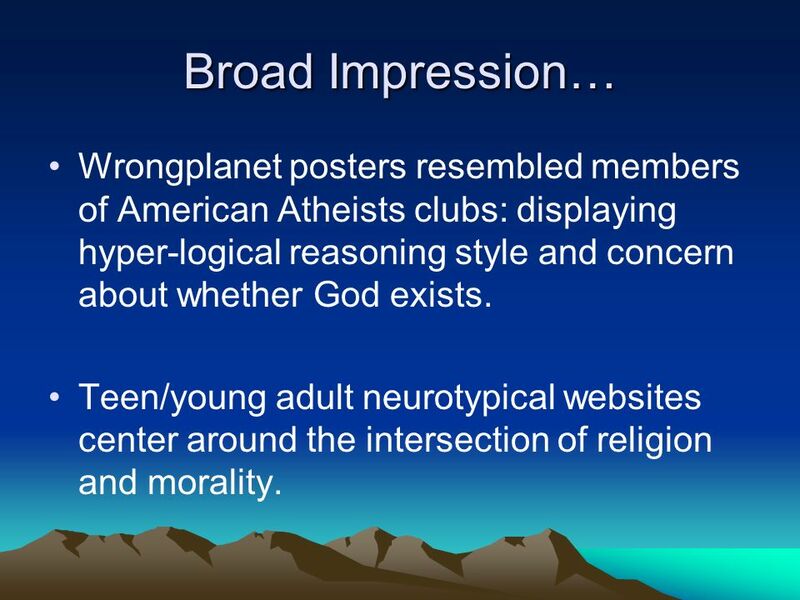 20 Broad Impression… Wrongplanet posters resembled members of American Atheists clubs: displaying hyper-logical reasoning style and concern about whether God exists. 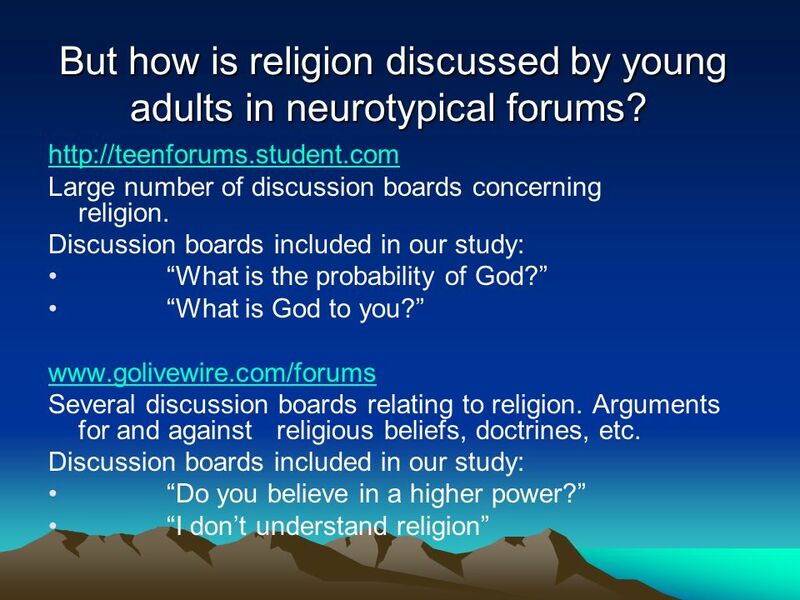 Teen/young adult neurotypical websites center around the intersection of religion and morality. 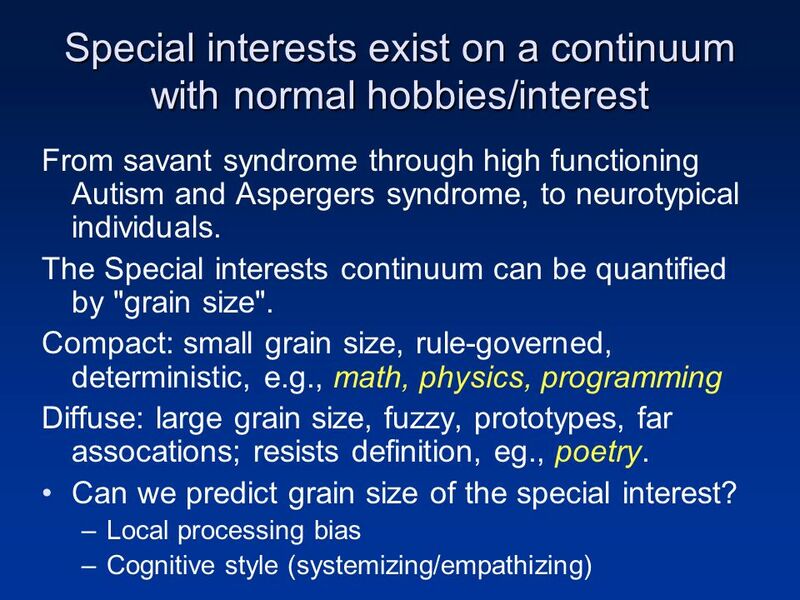 24 Autism and Special Interests Individuals with Autism Spectrum Disorder show intense focus on restricted topics, pursued with unusual intensity. 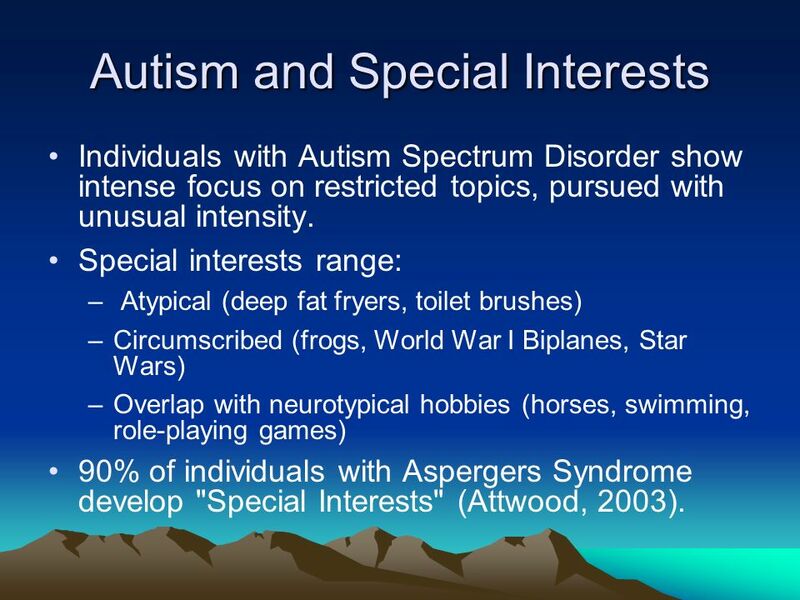 Special interests range: – Atypical (deep fat fryers, toilet brushes) –Circumscribed (frogs, World War I Biplanes, Star Wars) –Overlap with neurotypical hobbies (horses, swimming, role-playing games) 90% of individuals with Aspergers Syndrome develop "Special Interests" (Attwood, 2003). 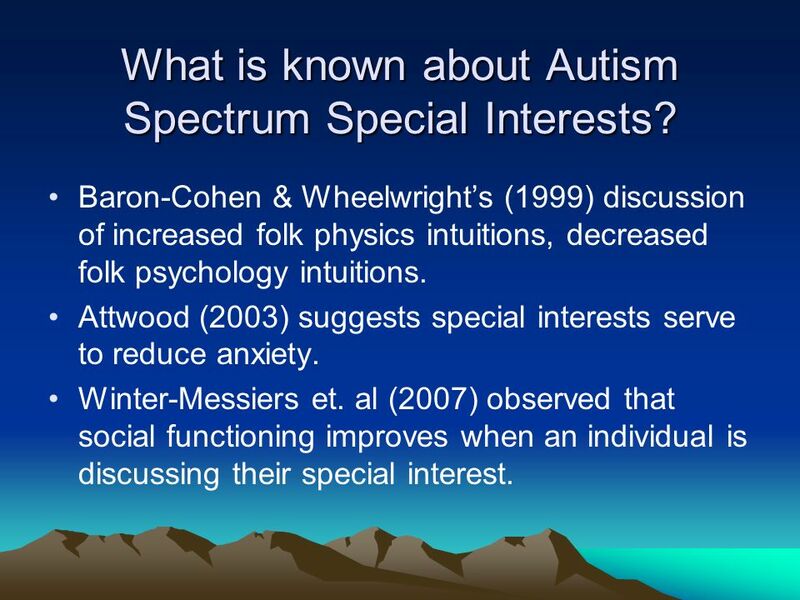 25 What is known about Autism Spectrum Special Interests? Baron-Cohen & Wheelwrights (1999) discussion of increased folk physics intuitions, decreased folk psychology intuitions. 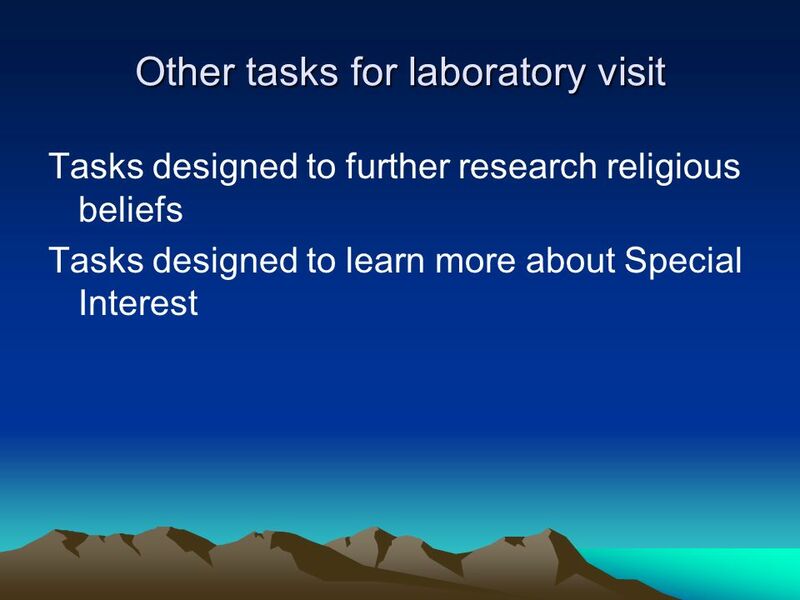 Attwood (2003) suggests special interests serve to reduce anxiety. Winter-Messiers et. 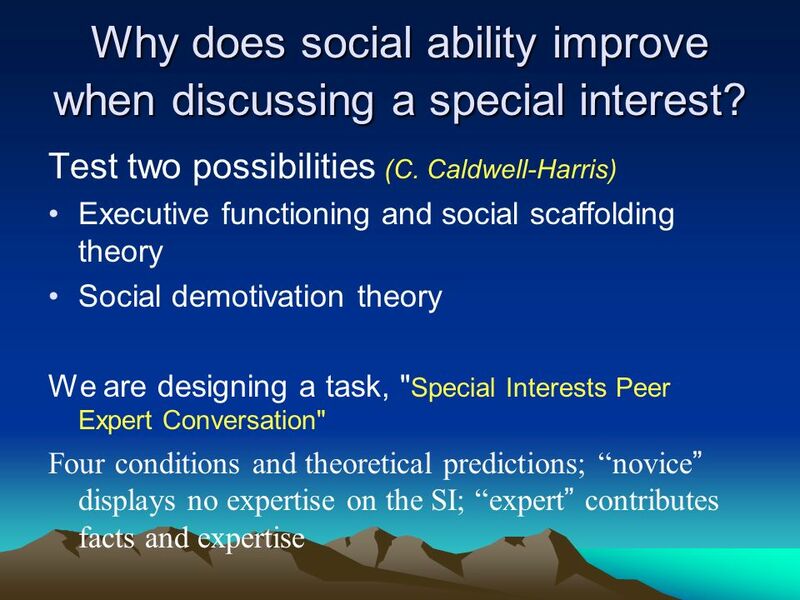 al (2007) observed that social functioning improves when an individual is discussing their special interest. 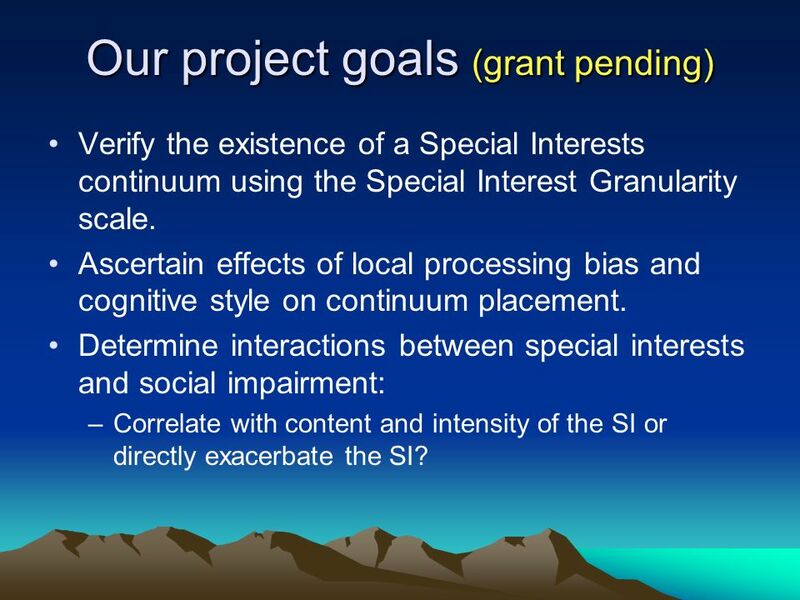 27 Our project goals (grant pending) Verify the existence of a Special Interests continuum using the Special Interest Granularity scale. Ascertain effects of local processing bias and cognitive style on continuum placement. 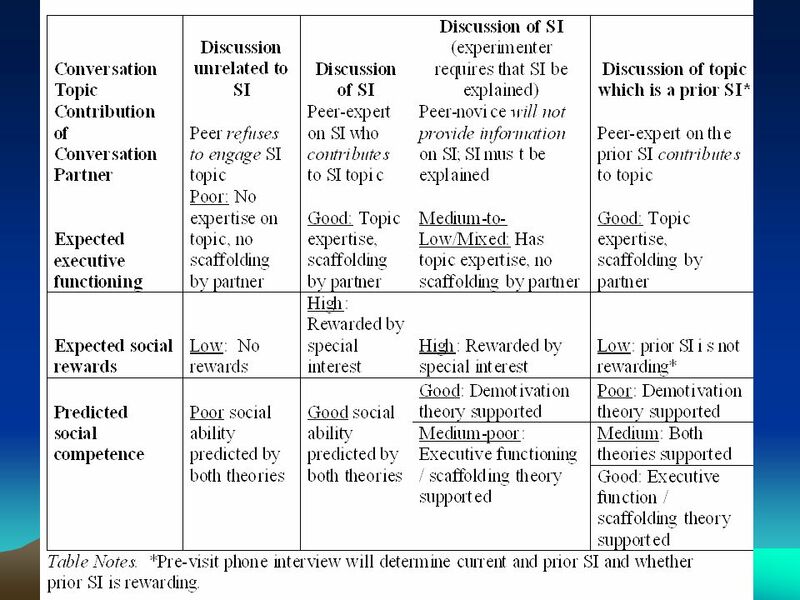 Determine interactions between special interests and social impairment: –Correlate with content and intensity of the SI or directly exacerbate the SI? 29 "Numbers" …. "Writing" "Numbers" …. 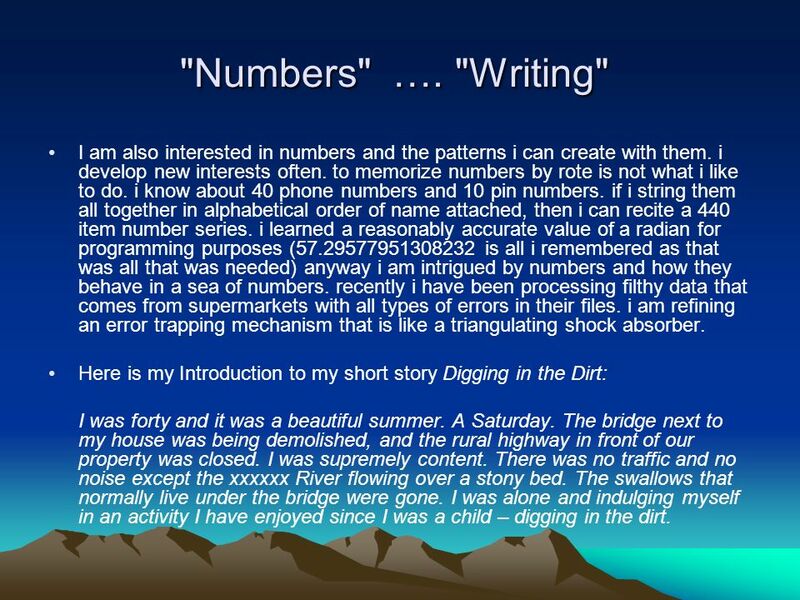 "Writing" I am also interested in numbers and the patterns i can create with them. i develop new interests often. to memorize numbers by rote is not what i like to do. i know about 40 phone numbers and 10 pin numbers. if i string them all together in alphabetical order of name attached, then i can recite a 440 item number series. i learned a reasonably accurate value of a radian for programming purposes (57.29577951308232 is all i remembered as that was all that was needed) anyway i am intrigued by numbers and how they behave in a sea of numbers. recently i have been processing filthy data that comes from supermarkets with all types of errors in their files. i am refining an error trapping mechanism that is like a triangulating shock absorber. Here is my Introduction to my short story Digging in the Dirt: I was forty and it was a beautiful summer. A Saturday. The bridge next to my house was being demolished, and the rural highway in front of our property was closed. I was supremely content. There was no traffic and no noise except the xxxxxx River flowing over a stony bed. The swallows that normally live under the bridge were gone. I was alone and indulging myself in an activity I have enjoyed since I was a child – digging in the dirt. 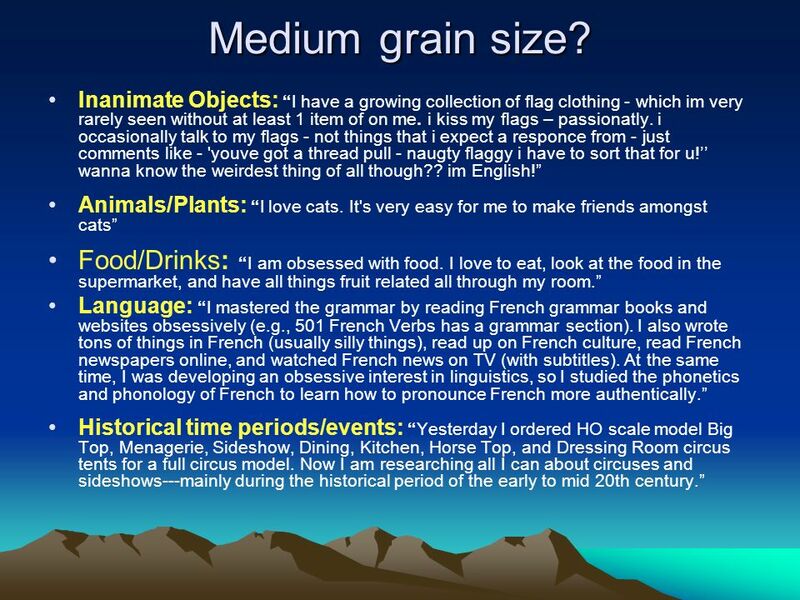 31 Medium grain size? Inanimate Objects: I have a growing collection of flag clothing - which im very rarely seen without at least 1 item of on me. i kiss my flags – passionatly. i occasionally talk to my flags - not things that i expect a responce from - just comments like - 'youve got a thread pull - naugty flaggy i have to sort that for u! wanna know the weirdest thing of all though?? im English! Animals/Plants: I love cats. It's very easy for me to make friends amongst cats Food/Drinks:I am obsessed with food. I love to eat, look at the food in the supermarket, and have all things fruit related all through my room. Language:I mastered the grammar by reading French grammar books and websites obsessively (e.g., 501 French Verbs has a grammar section). I also wrote tons of things in French (usually silly things), read up on French culture, read French newspapers online, and watched French news on TV (with subtitles). At the same time, I was developing an obsessive interest in linguistics, so I studied the phonetics and phonology of French to learn how to pronounce French more authentically. Historical time periods/events: Yesterday I ordered HO scale model Big Top, Menagerie, Sideshow, Dining, Kitchen, Horse Top, and Dressing Room circus tents for a full circus model. Now I am researching all I can about circuses and sideshows---mainly during the historical period of the early to mid 20th century. 32 Diffuse, Large grain size Diffuse, Large grain size Politics/ Government: I am Political junkie, die hard liberal, Adlai Stevenson Democrat ( look it up!) completely devastated by what the Bushies have done to our beautiful experiment in a democratic republic. I log into TalkingPointsMemo.com at 5:25 AM and check in all day (I have devised a scheme to do so at work) sometimes chaffing that there has been no updates for three whole minutes. GoogleNews, al Jazeria, Manchester Guardian, Xiang News service, I sleep with either KGO radio from SanFrancisco or the BBC overnight service in my ear. 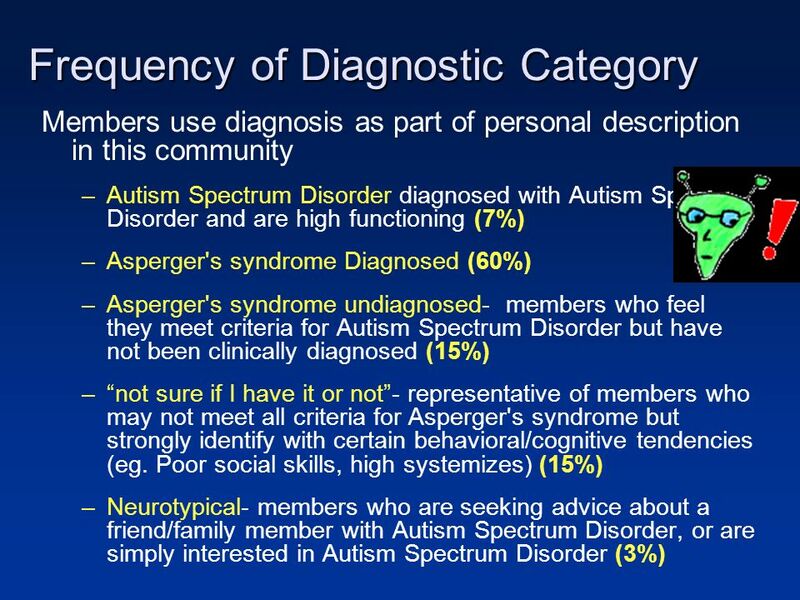 Mental Disorders/ Autism Spectrum Disorder: I am a psychology student. I personally am obsessed with Abnormal Psychology and Biopsychology and where the two cross over. I recommend going to a local university library and going through their psychology journals. American Journal of Psychology is good. They maybe even have some kind of computer system that will let you search for specifics of articles to make it easier. 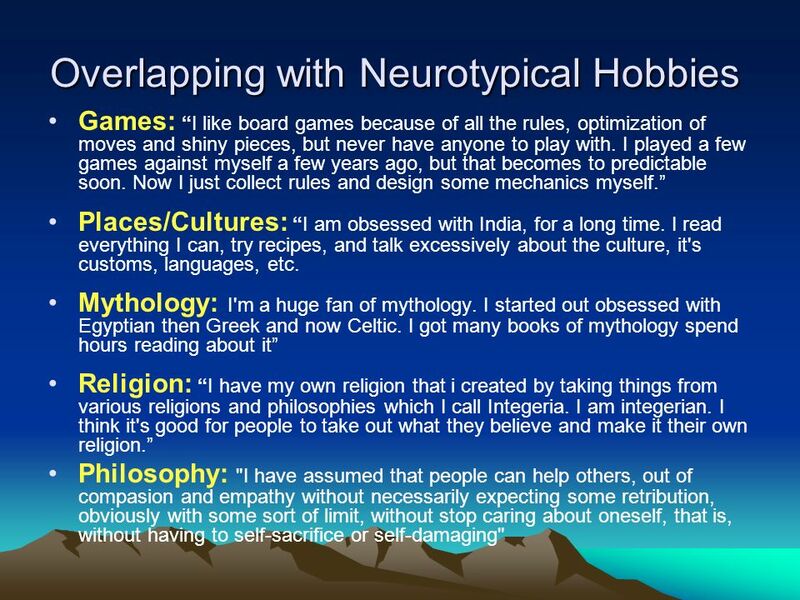 33 Overlapping with Neurotypical Hobbies Overlapping with Neurotypical Hobbies Games: I like board games because of all the rules, optimization of moves and shiny pieces, but never have anyone to play with. I played a few games against myself a few years ago, but that becomes to predictable soon. Now I just collect rules and design some mechanics myself. Places/Cultures: I am obsessed with India, for a long time. I read everything I can, try recipes, and talk excessively about the culture, it's customs, languages, etc. Mythology: I'm a huge fan of mythology. I started out obsessed with Egyptian then Greek and now Celtic. 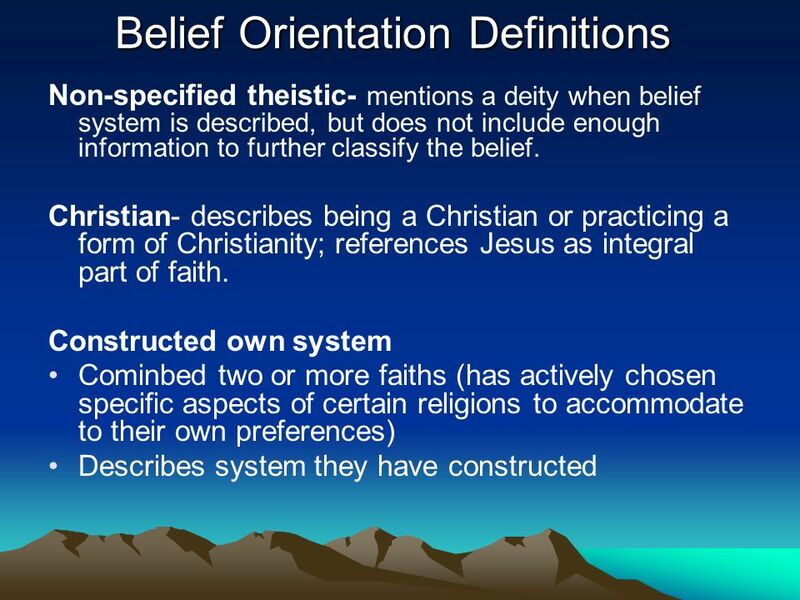 I got many books of mythology spend hours reading about it Religion: I have my own religion that i created by taking things from various religions and philosophies which I call Integeria. I am integerian. 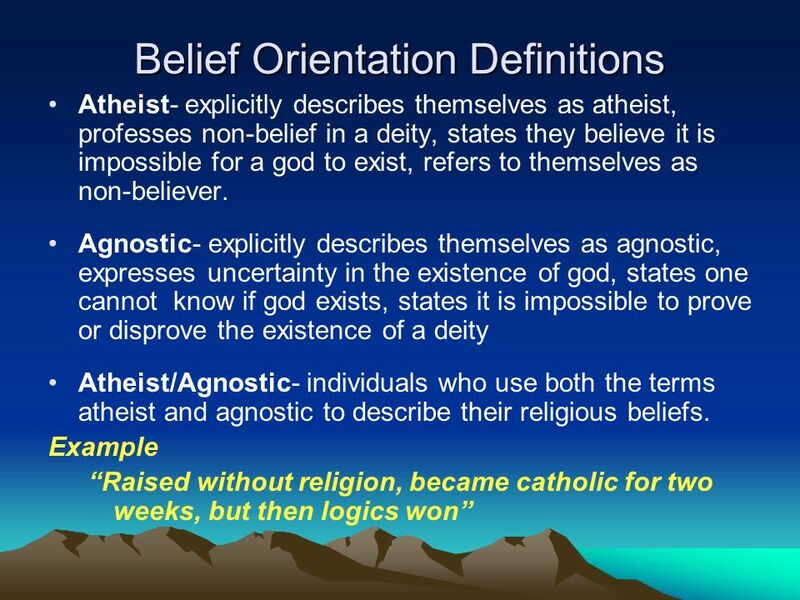 I think it's good for people to take out what they believe and make it their own religion. Philosophy: "I have assumed that people can help others, out of compasion and empathy without necessarily expecting some retribution, obviously with some sort of limit, without stop caring about oneself, that is, without having to self-sacrifice or self-damaging"
34 Overlapping with Neurotypical Hobbies People: My obsessions are "things" that I can't get enough of and can't stand them to ever end...So for me,most my BF's were more obsession then love. The Arts: (Music, Writing, Art, etc. ): If you listen to song 4000 times and are not bored of them, its not what NTs would call normal. 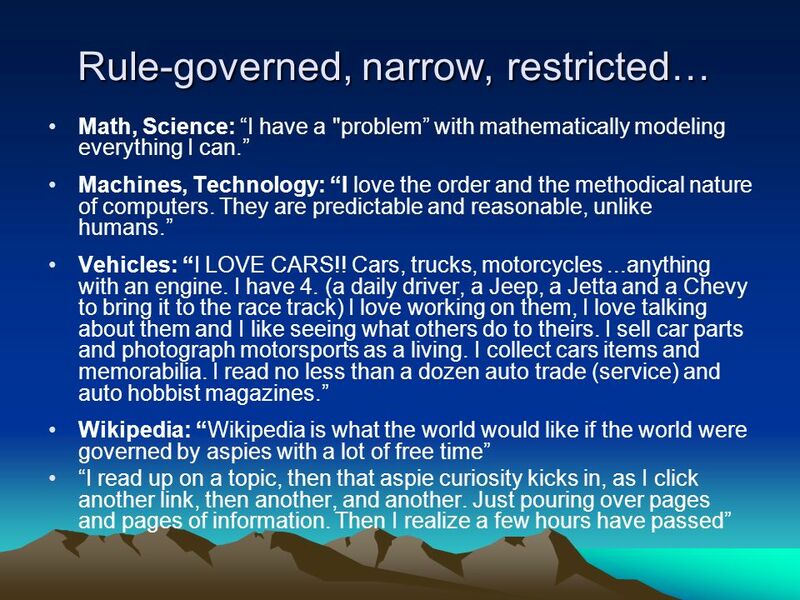 All Aspies are weird anyway, its a good thing the way I see it. I have been obsessed with music for as long as I can remember. I can play many different instruments, and was in the orchestra and choirs throughout school. I would spend hours in my bedroom at home either listening to music, practising, taping myself playing and then playing different scores with myself. I now love sitting in cathedrals when a service is on, and love the sound at xmas carol services. I also have many many CD's, of varying types of music which I listen to over and over again Writing:I love writing and I do not find dialogue difficult. Fictional dialogue is somewhat different than real dialogue, as it usually has a point, and is going towards something - it has its place in the grand scheme of things, and things that are said must be said, or at least lead to something that must be said. I cannot say the same thing of most conversations between people in the real world. 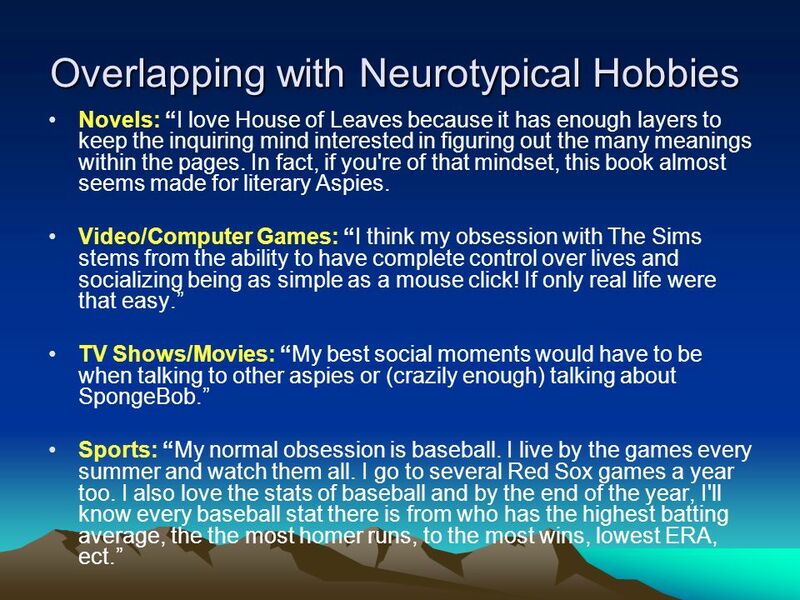 35 Overlapping with Neurotypical Hobbies Overlapping with Neurotypical Hobbies Novels: I love House of Leaves because it has enough layers to keep the inquiring mind interested in figuring out the many meanings within the pages. In fact, if you're of that mindset, this book almost seems made for literary Aspies. Video/Computer Games: I think my obsession with The Sims stems from the ability to have complete control over lives and socializing being as simple as a mouse click! If only real life were that easy. TV Shows/Movies: My best social moments would have to be when talking to other aspies or (crazily enough) talking about SpongeBob. Sports: My normal obsession is baseball. I live by the games every summer and watch them all. I go to several Red Sox games a year too. I also love the stats of baseball and by the end of the year, I'll know every baseball stat there is from who has the highest batting average, the the most homer runs, to the most wins, lowest ERA, ect. 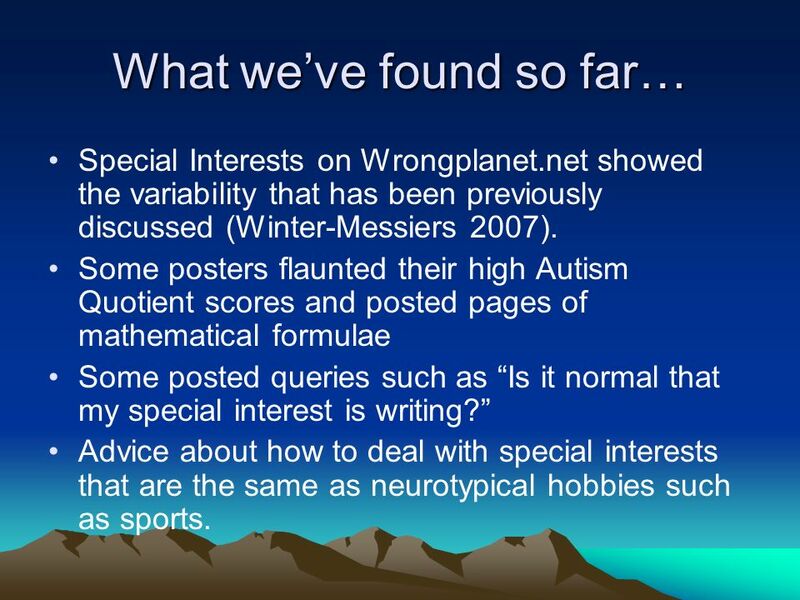 36 What weve found so far… Special Interests on Wrongplanet.net showed the variability that has been previously discussed (Winter-Messiers 2007). 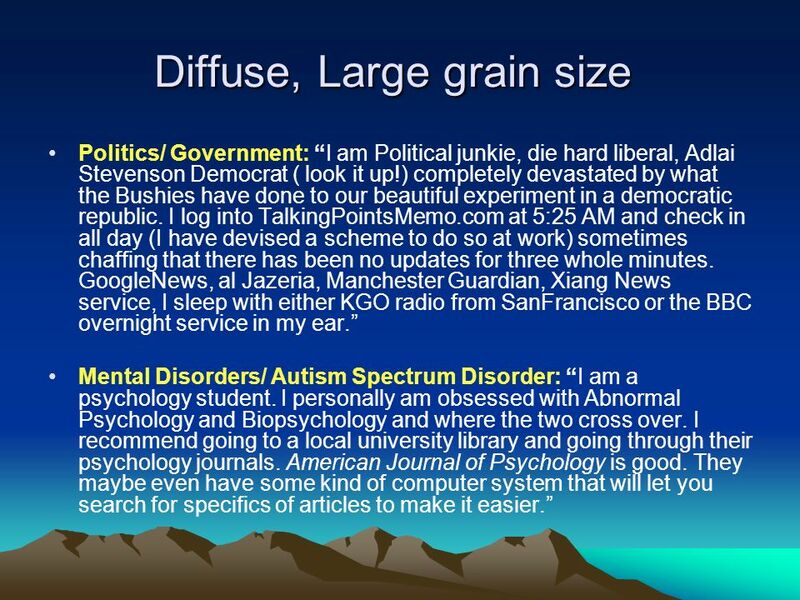 Some posters flaunted their high Autism Quotient scores and posted pages of mathematical formulae Some posted queries such as Is it normal that my special interest is writing? 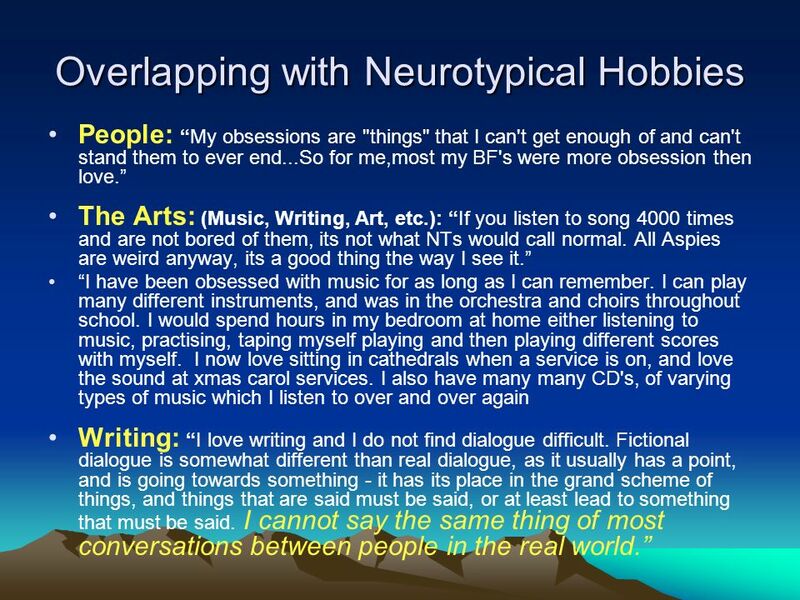 Advice about how to deal with special interests that are the same as neurotypical hobbies such as sports. 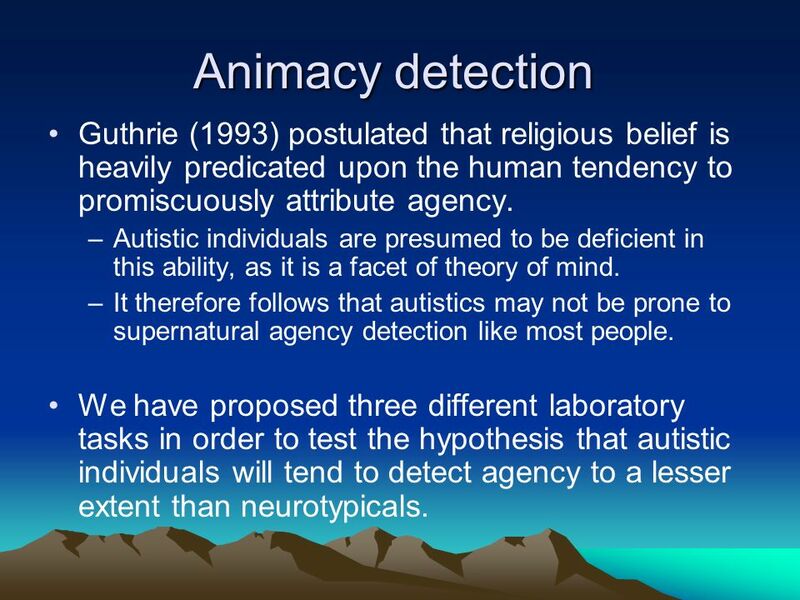 40 Animacy detection Animacy detection Guthrie (1993) postulated that religious belief is heavily predicated upon the human tendency to promiscuously attribute agency. 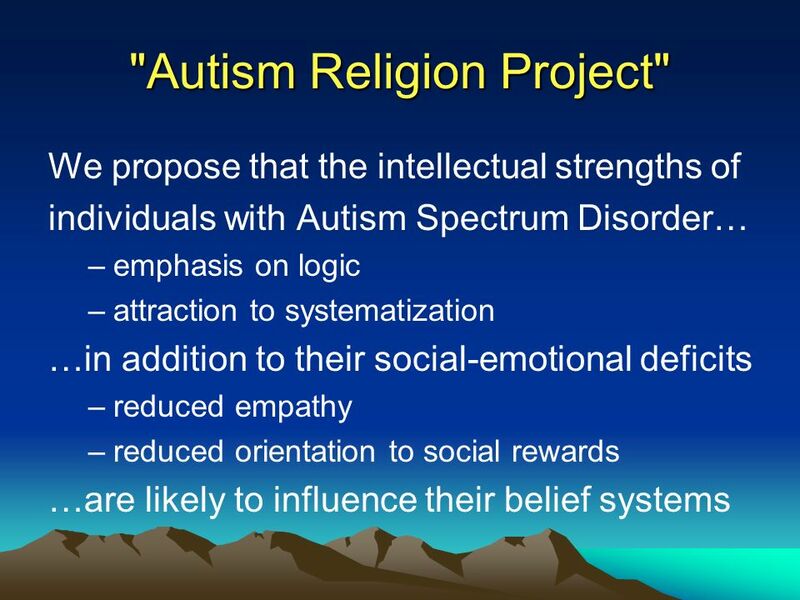 –Autistic individuals are presumed to be deficient in this ability, as it is a facet of theory of mind. 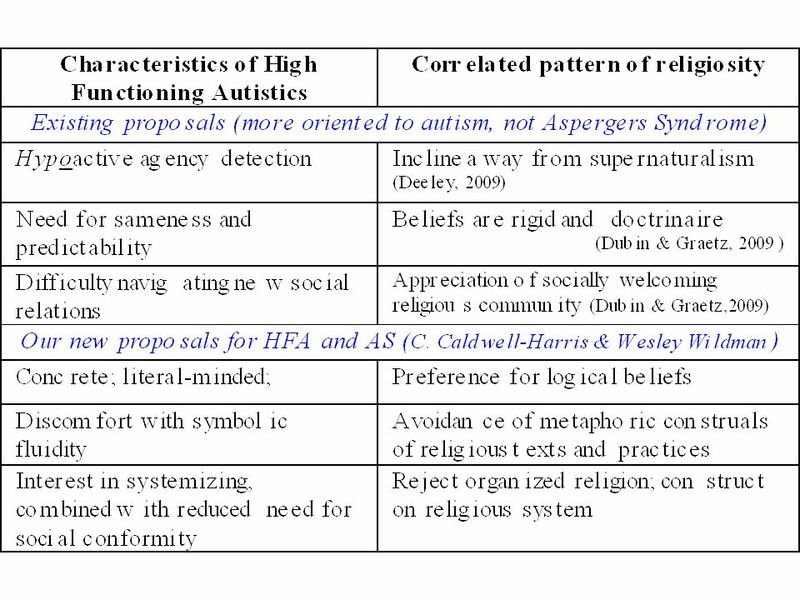 –It therefore follows that autistics may not be prone to supernatural agency detection like most people. 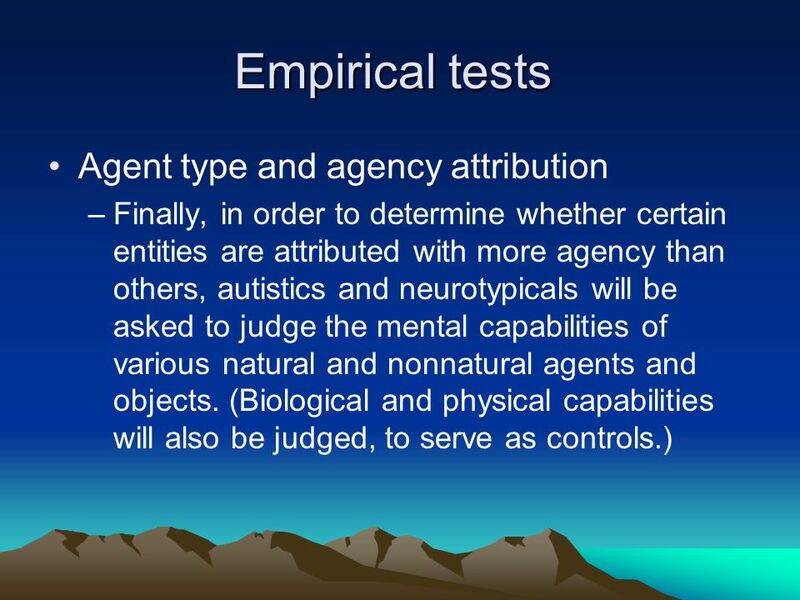 We have proposed three different laboratory tasks in order to test the hypothesis that autistic individuals will tend to detect agency to a lesser extent than neurotypicals. 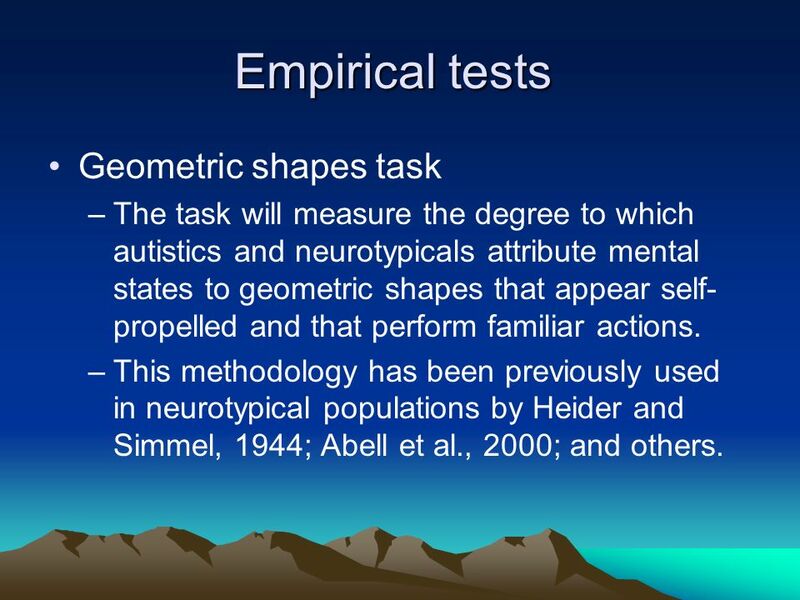 41 Empirical tests Empirical tests Geometric shapes task –The task will measure the degree to which autistics and neurotypicals attribute mental states to geometric shapes that appear self- propelled and that perform familiar actions. –This methodology has been previously used in neurotypical populations by Heider and Simmel, 1944; Abell et al., 2000; and others. 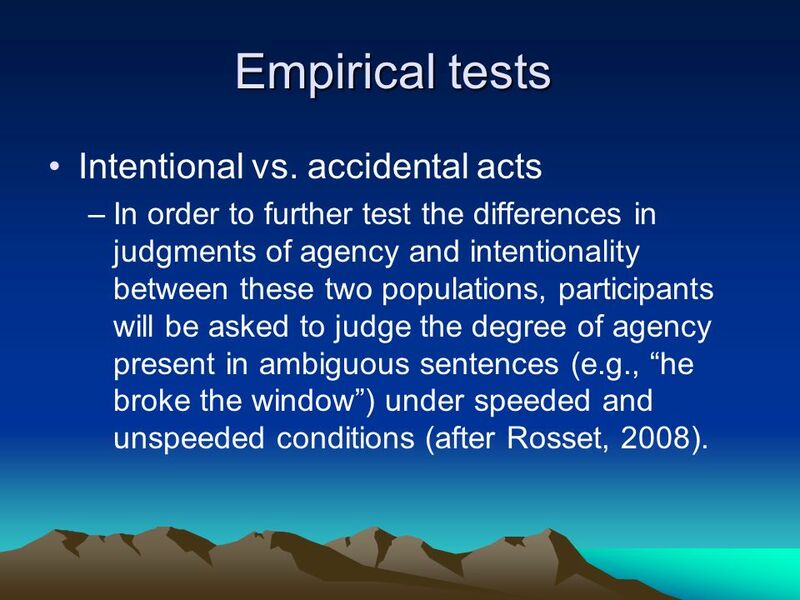 42 Empirical tests Empirical tests Intentional vs. accidental acts –In order to further test the differences in judgments of agency and intentionality between these two populations, participants will be asked to judge the degree of agency present in ambiguous sentences (e.g., he broke the window) under speeded and unspeeded conditions (after Rosset, 2008). 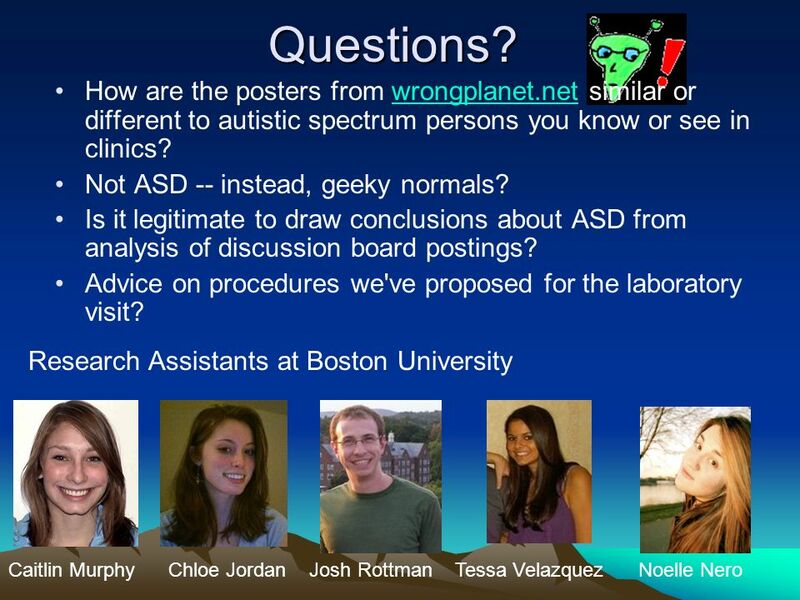 45 Caitlin MurphyChloe Jordan Josh Rottman Tessa Velazquez Noelle Nero Research Assistants at Boston University Questions? 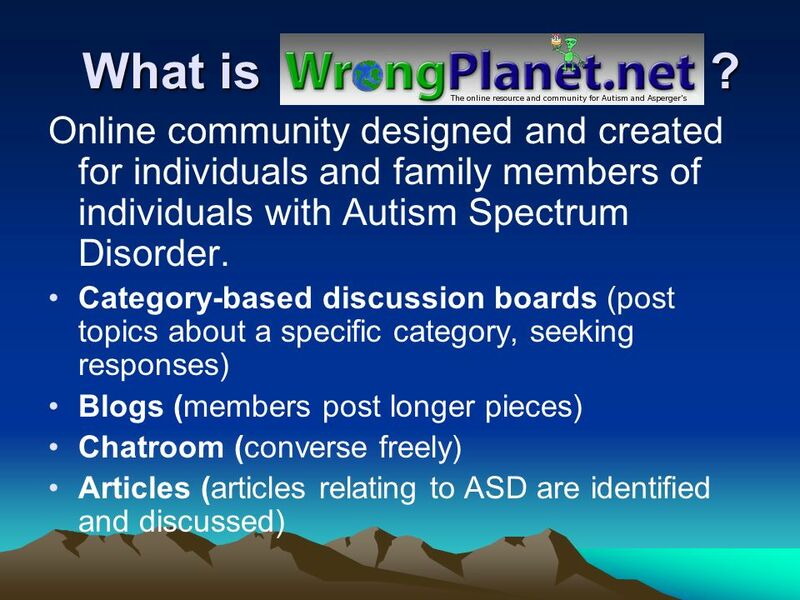 How are the posters from wrongplanet.net similar or different to autistic spectrum persons you know or see in clinics?wrongplanet.net Not ASD -- instead, geeky normals? 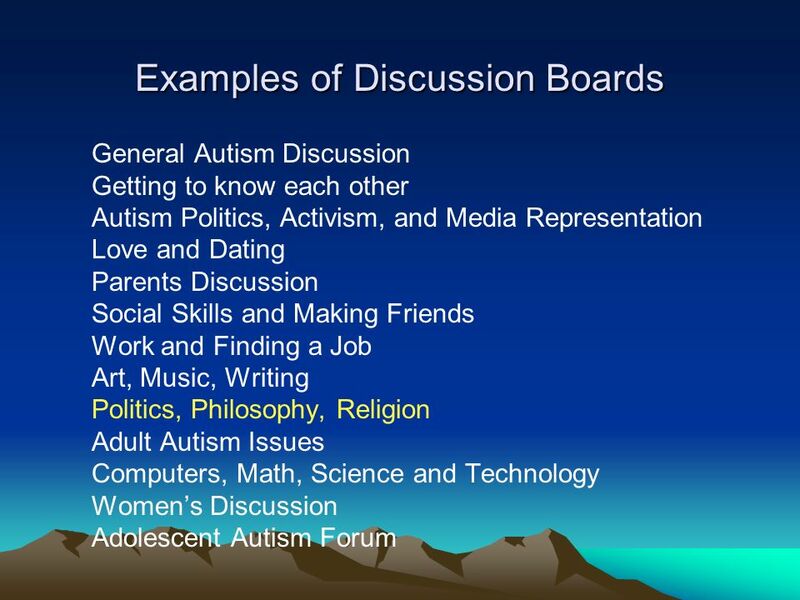 Is it legitimate to draw conclusions about ASD from analysis of discussion board postings? Advice on procedures we've proposed for the laboratory visit? 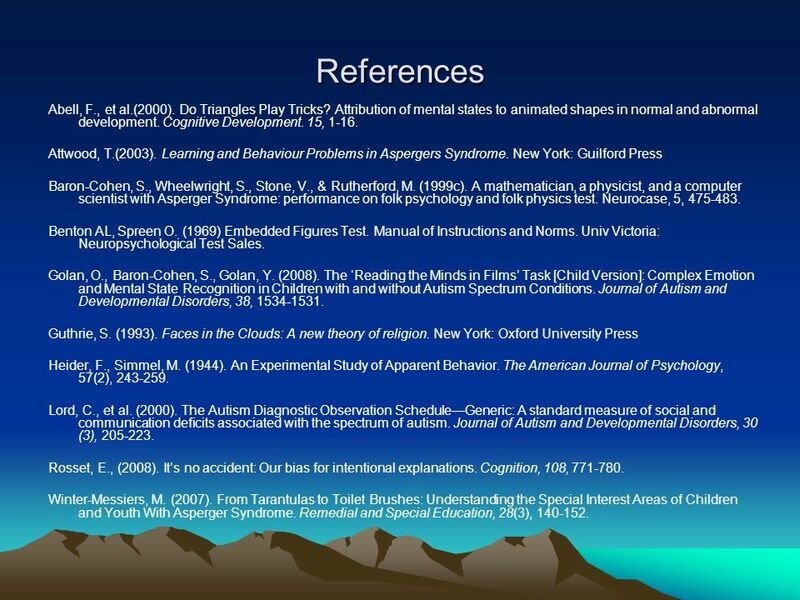 46 References Abell, F., et al.(2000). Do Triangles Play Tricks? Attribution of mental states to animated shapes in normal and abnormal development. Cognitive Development. 15, 1-16. Attwood, T.(2003). 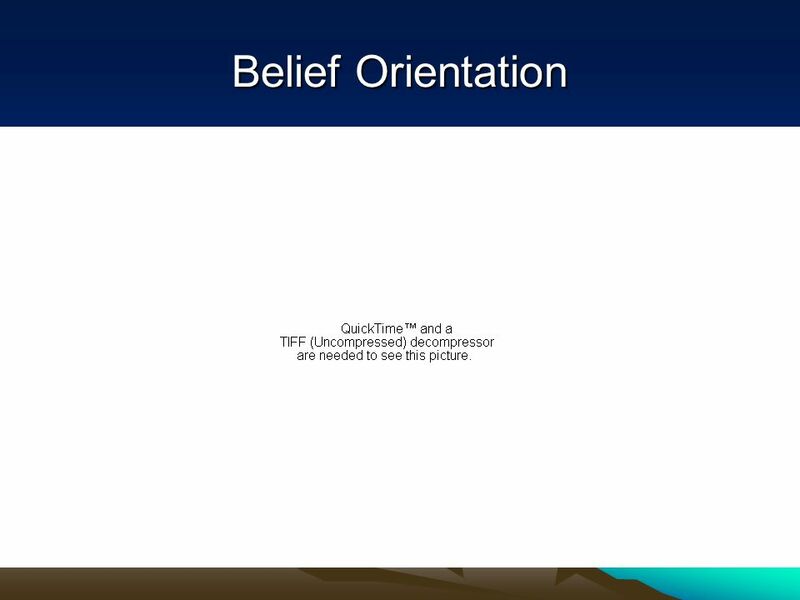 Learning and Behaviour Problems in Aspergers Syndrome. New York: Guilford Press Baron-Cohen, S., Wheelwright, S., Stone, V., & Rutherford, M. (1999c). 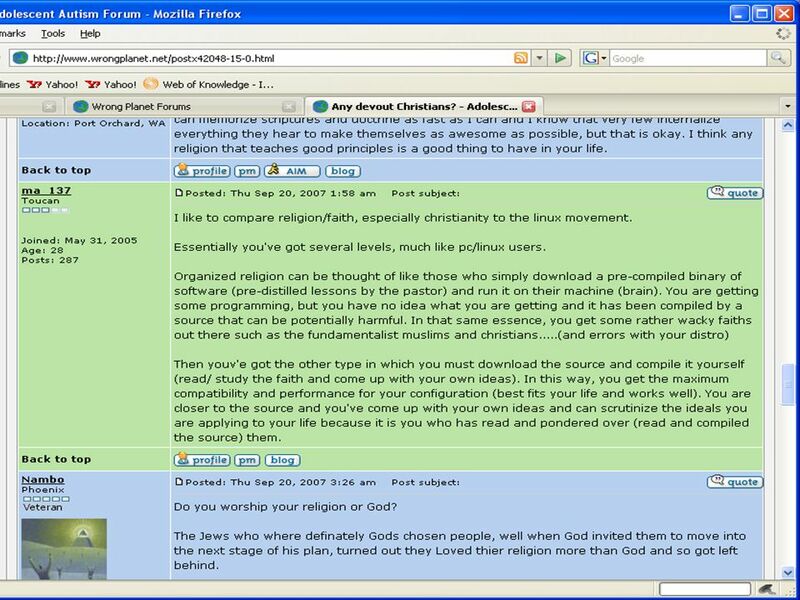 A mathematician, a physicist, and a computer scientist with Asperger Syndrome: performance on folk psychology and folk physics test. Neurocase, 5, 475-483. Benton AL, Spreen O. (1969) Embedded Figures Test. Manual of Instructions and Norms. Univ Victoria: Neuropsychological Test Sales. Golan, O., Baron-Cohen, S., Golan, Y. (2008). The Reading the Minds in Films Task [Child Version]: Complex Emotion and Mental State Recognition in Children with and without Autism Spectrum Conditions. Journal of Autism and Developmental Disorders, 38, 1534-1531. Guthrie, S. (1993). Faces in the Clouds: A new theory of religion. New York: Oxford University Press Heider, F., Simmel, M. (1944). An Experimental Study of Apparent Behavior. The American Journal of Psychology, 57(2), 243-259. Lord, C., et al. (2000). 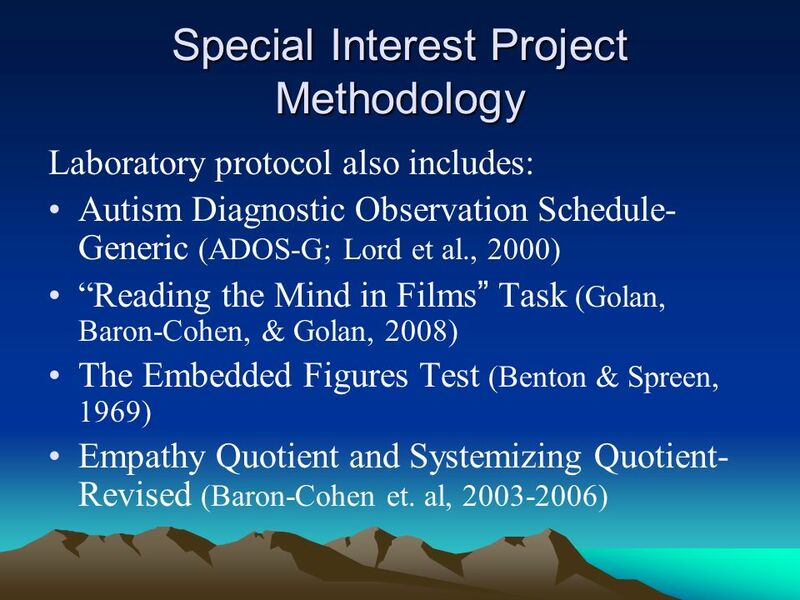 The Autism Diagnostic Observation ScheduleGeneric: A standard measure of social and communication deficits associated with the spectrum of autism. Journal of Autism and Developmental Disorders, 30 (3), 205-223. Rosset, E., (2008). Its no accident: Our bias for intentional explanations. Cognition, 108, 771-780. Winter-Messiers, M. (2007). 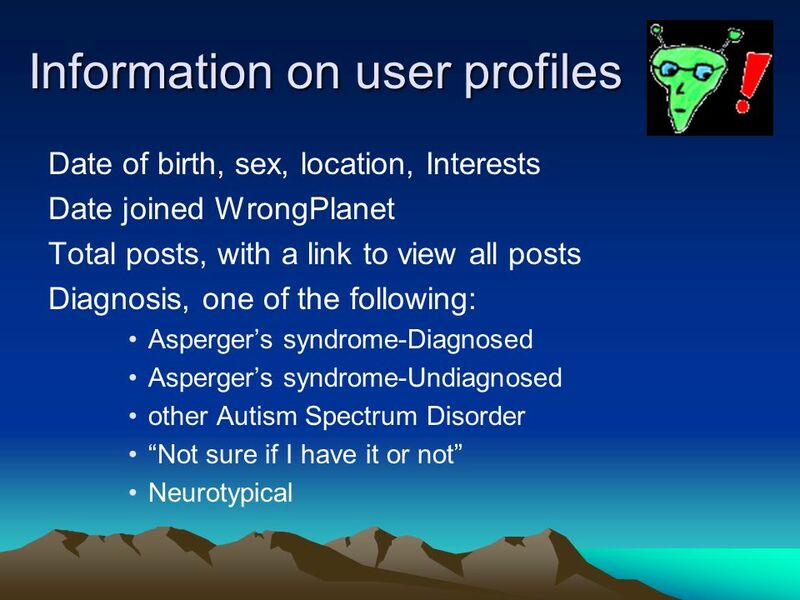 From Tarantulas to Toilet Brushes: Understanding the Special Interest Areas of Children and Youth With Asperger Syndrome. Remedial and Special Education, 28(3), 140-152. 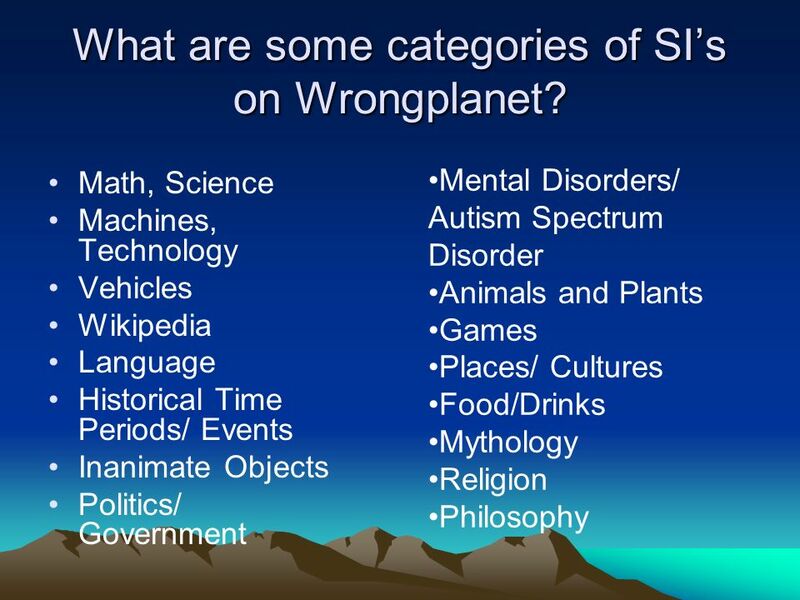 Download ppt "Born on the Wrong Planet? 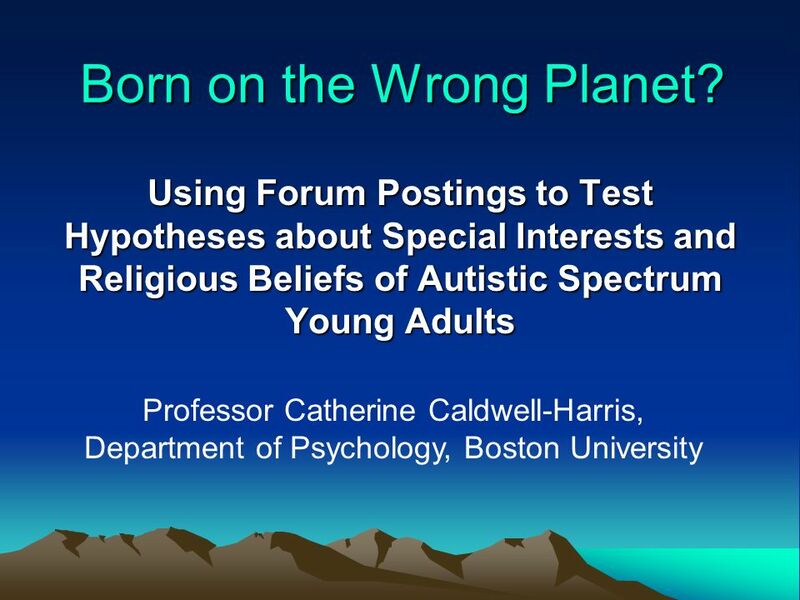 Using Forum Postings to Test Hypotheses about Special Interests and Religious Beliefs of Autistic Spectrum Young Adults Professor." Unit 3: Careers Introduction to Careers. Careers The best careers advice to give to the young is 'Find out what you like doing best and get someone to. Mary Riggs Cohen, Ph. D. Director, Social Learning Disorders Program University of Pennsylvania Department of Psychiatry Geena Mary Sankoorikal, BS University. Exams and Revision Some hints and tips. Slow Way Home Chapter 17 Unit 6 Lesson 1. 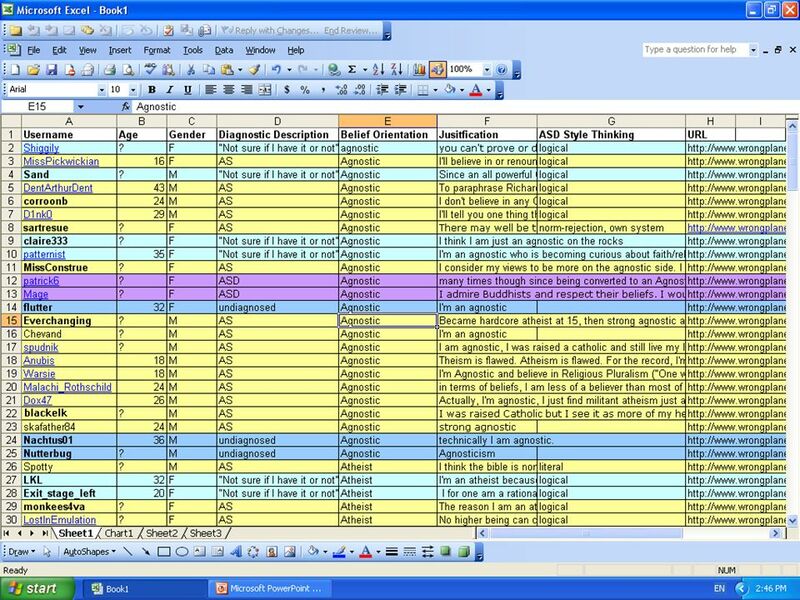 Sunshine State Standard LA The student will record information and ideas from primary and/or secondary. Autism Awareness Leaflet Autism is a disorder of neural development and affects information processing in the brain by altering how nerve cells and their.